How Far is Kalash Homes? A premium housing project launched by Fortune Properties, Kalash in Pirangut. It offers 1, 2 BHK Apartment in Pune West. The project possession Started From Dec 16. 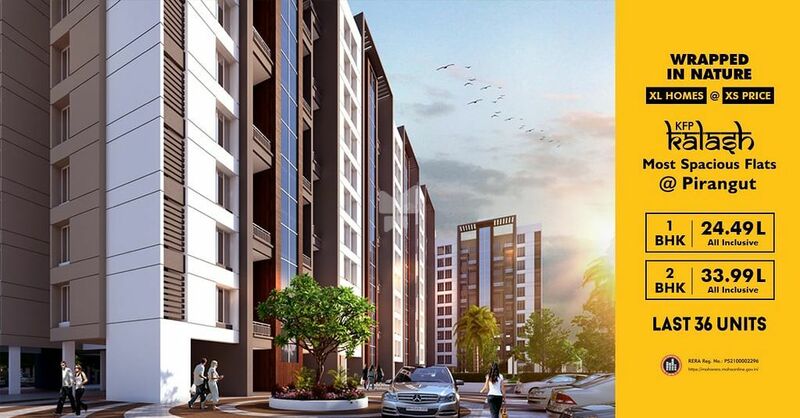 Among the many luxurious amenities that the project boasts are Lifts, Power Backup, Senior Citizen's Sit out Corners, Skating Play Court, Children's play area etc. Come, witness a prosperous beginning at Kalash Homes. RCC framed structure with 5"/6" thick walls. Lift for each building with back-up. Marble / Granite kitchen platform with stainless steel sink and glazed tiles dodo upto 2' height. Headquartered in Mumbai & Pune, KFP is a merger of Kalyanee Construction and Fortune Properties. Over the last 25 years, the company is successfully developing over 12 lac sq. ft. of a range of budget-friendly, amenity-rich, and luxury residential spaces in and around the city. Today, KFP has earned its reputation as one of the leading real estate companies, operated by some of the most experienced and visionary leaders in the industry. Empowered by a dynamic mix of young ideas and veteran leadership, we are able to deliver innovative solutions and comfortable living experiences in all our projects. Known for our superior service, outstanding quality of construction and proven trust of timely delivery, we have an extensive portfolio that includes some landmark projects in the city. By offering affordable luxury homes to thousands of families, we are building a legacy of happiness and exceeding the expectations of every customer. KFP creates value for its clients and partners through the development of quality environments with a vision to maximize returns from investment for its customers. Poised to acquire and develop the most promising properties, Kalyanee Fortune Properties focuses on creating long-term wealth for its clients and partners through building a successful portfolio of assets. Honouring our values of integrity and transparency, we always strive to build a lifetime relationship with every customer. As we move towards a greener and brighter future ahead, we envision building on a global result-oriented strategic approach and adapt it to suit the local market needs.